The recent fatality of a pedestrian walking on the sidewalk and a cyclist riding on Claremont Access highlight the unmet need for safe pedestrian and cycling infrastructure in Hamilton. A cyclist has just been killed on the Claremont Access last night. I'm saddened as I write this, also remembering the gentleman who was struck walking on the sidewalk on York Boulevard and died from his injuries earlier this week. In both these cases, the driver was at fault. When drivers make mistakes, the results are lethal. These deaths really highlight the unmet need for safe pedestrian and cycling infrastructure in Hamilton. As the 2013 SPRC report Hamilton's Risky Streets concluded, Hamilton has an injury risk for pedestrians that is 42 percent higher than the provincial average, and an injury rate for cyclists that is 81 percent higher than the provincial average. That should not be acceptable to anyone. I urge council to direct staff to look at some low-hanging fruit that could quickly start to improve safety in our city. 1. Install the new, lower LED sidewalk-focused lights on all major arteries. Main Street has them in front of City Hall. They illuminate the sidewalk wonderfully. I live near York Boulevard where the pedestrian was killed last week, and I rarely walk it at night. The sidewalks are very, very dark. 2. Install a barrier-protected multi-use path on the northern-most lane of the Claremont Access. It can connect to West 5th and to Southam Park. A barrier like the one on King Street over Hwy 403 would work wonders. At the bottom, a two-way protected bike lane can continue north to the waterfront on Wellington Street in the west lane. Wellington carries 10,000 cars a day on four lanes - there is more than enough room to make some safe space for cycling. 3. Institute 'no right on red' in all pedestrian-oriented districts: downtown cores, BIAs, transit-heavy streets, near transit terminals, and so on. Just yesterday, I saw two pedestrians almost get hit while crossing the street on a green light in the crosswalk, because the driver approaching a red was going to roll right out and attempt their right on red without stopping. This happens every single day, over and over. No right on red keeps everyone simply stopped for their red light. It's tough enough to walk in this city, let alone still being almost hit while crossing on a green. Montreal has 'no right on red' on the entire island. This is scratching the surface, I realize. But I'm suggesting some very simple, low-hanging fruit so we can show that we are resolved to actually do something to prevent more tragic deaths in the future. Small steps immediately in the right direction are needed at a time like this. Montreal was faced with a similar week with multiple deaths recently, and they acted very quickly in response. We owe it to ourselves to show the same level of concern for our vulnerable residents. Absolutely Jason. All sensible solutions that can be implemented quickly and cheaply. People are dying for bad policy. It must stop. another easy, quick-win would be to repaint the Queen Street Hill. Instead of crazy wide lanes and an empty painted off yellow zone down the middle (which now has the city scrambling to put up bollards, speed limit signs and huge letters on the street in an effort to stop speeding), let's narrow the lanes, shift them over to the south and add a multi-use path on the north side of the access. Another one is again on the Claremont on the southern lane that has been closed for years. A multi-use path connecting Charlton to Rosdedene (which connects easily to Sam Lawrence Park). Claremont lanes are wider than the 401. Why do we need a full-fledged expressway connecting residential streets on the bottom with a retail district on the top? Buffalo had ONE pedestrian killed in a park along the 198 expressway last year and immediately came out and dropped the speed limit and repainted the entire roadway with much narrower lanes to curb speeding. We have some of the most dangerous roads in Ontario and council does nothing to improve it. Claremont would have gobs of excess space if lanes were brought down to 9-10 feet in width. Vision Zero needs to be pushed hard on city hall. Clearly they aren't ever going to lead, so residents need to pressure them constantly. Oh my god, I had no idea! How long has Council & City Staff known that we have these injury risk stats? How long do we have to wait for the powers that be to realize this should be the NUMBER ONE priority !?! We all understand there are limited resources, but seriously, we're spending funds on statues and the likes ahead of being able to safely walk/cycle our streets all the while knowing these stats? It just boggles the mind !!! Do our decision-makers not understand that one of the reasons more cars are on the roads these days (and why motorists for the most part want roads repaved) is because people don't choose to walk/cycle because they don't feel safe. Do we really need to waste precious resources (time and money) begging Council for something that we all long for? Knowing these stats, and not acting immediately by taking pro-active measures (ahead of all the other "nice to haves"), just completely defies logic. It was reported fairly widely when the report came out in November 2013, two years ago. Meanwhile, just yesterday it took two hours of citizen delegations and heated debate before Council finally agreed to ask staff study one street next year for possible traffic calming. 60 years of failure. And yet we still have to fight tooth and nail to get most councillors to listen to the problem(understanding it is another thing, and acting is yet another still). Next October - let's say happy birthday to Hamilton's one ways and change them back? It happened overnight. We CAN change them back overnight. Or is city hall so far gone that we can't accomplish now what we "accomplished" over half a decade ago? These kinds of deaths are extremely sad, and often result from a momentary lapse of judgement on the part of any road user. But they are totally preventable by using infrastructure design principles well understood around the entire world - everywhere that is except inside the walls of Hamilton's council chamber. These deaths are less the fault of the 60 milliseconds of bad decision making on the parts of the road users than they are the fault of 60 years of bad decision making on council. "3. Institute 'no right on red' in all pedestrian-oriented districts"
Yes! There are many intersections crying out for this. Many Hamilton motorists seem to have entitlement issues, and they think it's perfectly acceptable to perform a rolling stop into a red light when making a right turn, block the crosswalk (the sidewalk) while they wait for a gap in traffic, and make their turn without ever looking right to see if there are people on foot being impeded. Quebec has this one right, but we can at least fix this (at the cost of a street sign) at intersections that see a lot of foot traffic. yep - and while we are it it we need to tighten up the turning radius on every downtown corner. Here is a great example... Catharine and Wilson. 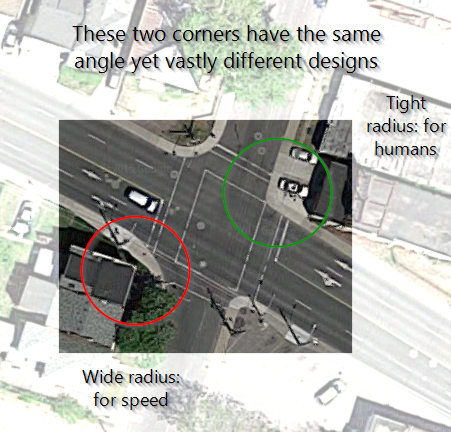 Because Wilson was originally designed as a one way highway, you can see the result of putting speed first (southwest corner) versus designing a corner for normal humans where vehicular speed is not a priority of the design (northeast corner). These corners are at the same intersection angle... but the radius difference says it all. Seancb, I need to hire you to teach me how to do this for a similar corner out here in the Creek. Would you please be able to email me at lakewoodbeachcc@hotmail.com ? download greenshot - open source screenshot program. i whipped this up in a few minutes by taking a screenshot and using the greenshot "open in editor" function. Hamilton Police Collision Reconstruction Unit investigating fatal collision On Wednesday December 2, 2015 just before 6:00pm the Hamilton Police Service responded to reports of a cyclist being struck by a black coloured pickup truck on the Claremont Access. It was indicated that the vehicle involved failed to remain at the scene of the collision. Witnesses saw the collision take place and immediately came to the victim's aid and started rendering medical assistance in an attempt to save the man's life. Hamilton Paramedics responded to the scene to assist but unfortunately the 53-year-old man from Hamilton died as a result of his injuries. The Hamilton Police Collision Reconstruction Unit responded to the scene and began investigating and spoke to a number of witnesses. The Hamilton Police Service Forensics Unit also responded to collect evidence and process the scene. The Claremont access remained closed throughout the night. Information obtained as a result of the investigations led Detectives to an address on the west mountain area in Hamilton where the vehicle involved in the collision was located. Detectives worked throughout the evening and obtained a warrant to seize the vehicle. The vehicle was seized as part of the investigation. A 55 year old person of interest was taken into police custody for questioning by Detectives. The man was interviewed by Detectives and later released unconditionally at this time. Police have not been authorized to release the name of victim at the request of the family who are asking for privacy at this time. This is the 16th fatal collision investigation in the City of Hamilton in 2015. Detectives continue to investigate and are now appealing for any other witnesses who may have information about the incident to contact them. Detective Matt Hewko or Detective Benjamin Paterson can be reached by phone at 905-546-4955. To remain anonymous you can also call Crime Stoppers at 1-800-222-8477 or submit information online at http://crimestoppershamilton.com. The problem: even though Wellington doesn't get much traffic, it does manage to back up between King William and the access at rush hour. Considering its massive width and the wide-open Clairmont, I assume this is caused by light timings more than anything. This would make getting a Wellington/Clairmont lane challenging, because there would be a lot of political resistance from commuters, particularly ones coming from the Upper James/West 5th area of the mountain. Who's their councilor again? Ethics: Human life and health are paramount and take priority over mobility and other objectives of the road traffic system Responsibility: providers and regulators of the road traffic system share responsibility with users; Safety: road traffic systems should take account of human fallibility and minimize both the opportunities for errors and the harm done when they occur; and Mechanisms for change: providers and regulators must do their utmost to guarantee the safety of all citizens; they must cooperate with road users; and all three must be ready to change to achieve safety. Traffic deaths and injuries are preventable; therefore, none are acceptable. ·People will make mistakes; the transportation system should be designed so those mistakes aren’t fatal. ·Safety is the primary consideration in transportation decision-making. Traffic safety solutions must be addressed holistically. I recently found this notice while thinking more about this article: http://cyclingmagazine.ca/sections/news/... which states: The motorist, a 56-year-old man whose name has been withheld, was charged with careless driving. He's scheduled to appear in court on March 30, 2016. Was there ever any conclusion to this situation?